“The New Year’s postcards are a playful way to convey a very serious concern of our communities about ever-increasing utility rates and persistently high fixed charges,” said CLP Director Jen Metzger. “The rate cases currently under review offer the Commission a unique opportunity to advance the goals of the Governor’s Reforming the Energy Vision (REV) Initiative in a way that will lower costs for most customers. Few other reforms contemplated to date could have a more sweeping impact on the ability of New Yorkers to control costs by managing energy use.” Adorned with festive New Year’s hats, members of CLP presented the New Year’s postcards to PSC Secretary Kathleen Burgess in the moments before the PSC’s official monthly meeting got underway at 10:30 am. High fixed charges constrain the ability of residents and small businesses to control their energy bills by using less since all customers pay the same fixed charge regardless of how much energy they use. High fixed charges are particularly burdensome for low and moderate income customers, who tend to use less energy than average. Across the state, consumer, energy, and environmental organizations are calling for reducing New York utilities’ high fixed charges. In October 2017, as part of the National Grid rate case, Acadia Center submitted to the PSC Joint Principles on Residential Fixed Charges in New York, signed by 53 organizations. The following month, CLP filed a letter in the Central Hudson rate case signed by over 130 local elected officials urging the Commission to take action to reduce the fixed. More information on the fixed charge issue can be found at www.lowerfixedcharges.org. It's not too late to make your voice heard! You can still fill out the form here and a postcard will be submitted to the PSC on your behalf. 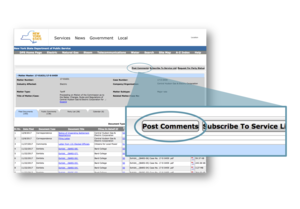 You can also submit a comment directly to the PSC for their review in the Central Hudson rate case.